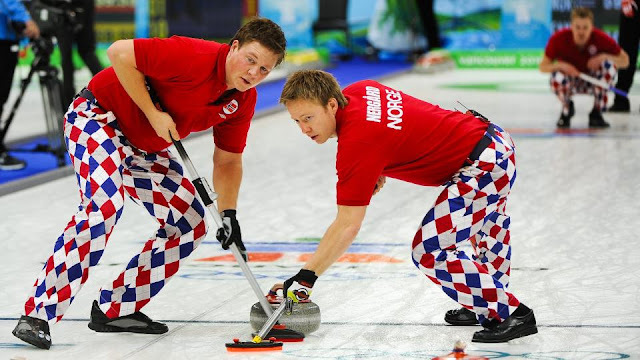 Apparently the news in Canada wanted you to wait until tomorrow to see those super cute Norwegian curling pants,but here is an early bird preview of them all festive in argyle! !!! Canada vs Norway hockey game tonight.. are you watching it? Sockboy! I heard it ended 7-6? But it was a good game? I wish I got to see it! Kate! I WISH I watched that game too! Like I said in my new post, I am in the wrong country to be watching the olympics with the 6 hour plus Vancouver's 3 hours behind so really 9 hours difference. It's killing meee! But 8-0 is pretty sweet for us! Did you both watch it? Of course i watched it! it was awesome i have been glues to the tv lol ... school work is suffering! too bad your not here.. its crazy awesome :) when are you coming back?